The Star Tribune appears at your front door, or when you tap your device, but do you know how it is produced? Sure, many of us in publishing, whether content creators or sales and marketing pros, can imagine how the state’s largest daily comes together. But do you know how “the news” is made? How story decisions happen? Have you been to a “news huddle”? Star Tribune editors sit around the table at a 3:30 pm News Huddle to discuss current reporting activity and upcoming content for the paper. MMPA members sat along the wall in the open meeting room. “The Star Tribune welcomes visitors who are curious about how decisions get made. Since the paper operates to shed light on issues of the day, we also want to shed light on our own process,” said Sue Campbell, Features Editor and MMPA Board member. “It’s great to have fellow publishers visit because they ask deeper questions – and this group in particular got a lot of conversation going. A select group of MMPA members attended a Star Tribune 3:30 pm news huddle on Wednesday March 13. This event was the first in the new MMPA Professional Development Series. MMPA is currently planning more of these events focused on networking and learning for young media professionals. Seated along the back wall of an otherwise-open meeting room, event attendees watched 16 or 17 Strib editors discuss current website traffic and future editorial plans, including the next day’s stories. The news huddle meeting was lead by Suki Dardarian, Sr. Managing Editor and V.P. ; and Rene Sanchez, Editor and Senior V.P. of the Star Tribune. Editors of each section (Sports, Nation, Variety, Business, etc.) had a few minutes to share the reporting they were working on. During the huddle, Dardarian and Sanchez would occasionally press for more details, or ask for clarification on the direction of that reporting. Another version of the news huddle takes place each morning. 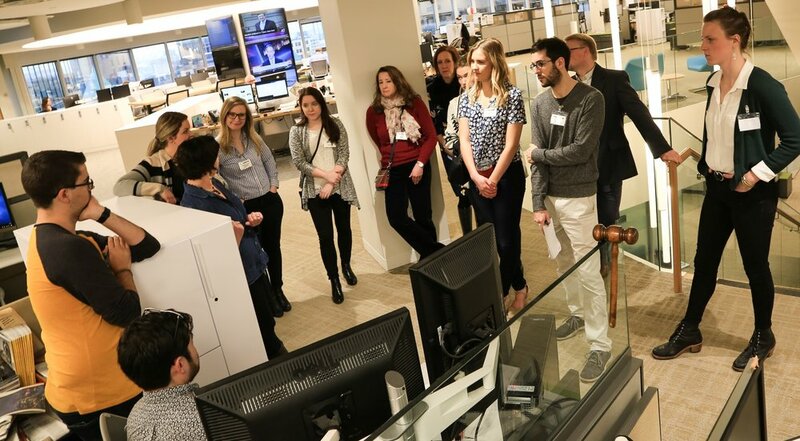 Campbell lead a tour of the Star Tribune editorial offices, for MMPA members attending. Stopping to peer over one designer’s shoulders, attendees watched the Star Tribune’s Josh Jones organize front-page stories using Adobe InDesign publishing software. He explained the production and design-approval process as he showed us how he manipulates content on the page. MMPA members attending: Laura Burt, Sue Campbell, Maria Douglas Reeve, Zac Farber, Suzy Frisch, Zoe Gahan, Glenn Hansen, Steve Hedlund, Sarah Jackson, Rob Johnstone, Tim Morgan, and Hannah Swan.